Nerf Night is a favorite of our students, one that they look forward to each year. I’ve put on Nerf & Nachos Night for the last three years, and we are looking forward to it again Friday! We communicate to our students that they may bring their own Nerf gun (we label it with painter’s tape and duct tape as soon as they walk through the door), but to leave the darts at home. 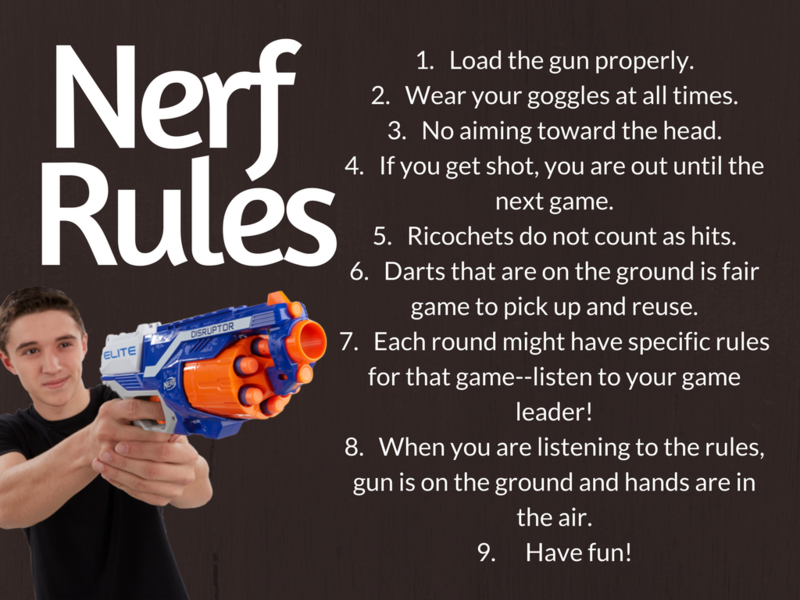 As a note, our Communications Director at the church advised me several years ago to be careful about the language I use for Nerf: saying “darts” instead of ammo, things like that. Wear your goggles at all times. No aiming toward the head. If you get shot, you are out until the next game. Darts that are on the ground is fair game to pick up and reuse. Each round might have specific rules for that game–listen to your game leader! When you are listening to the rules, gun is on the ground and hands are in the air. Students will use barriers to eliminate the other team. Once out, people will come to the sides of the gym and root their team on. You can add in bases–essentially, a target on all sides of the gym for teams to protect. If a team’s base gets hit with a dart, the game is over for the team. Each person gets a gun, and scatter them around the four sides of the room. Students race to the center to grab darts for their gun and shoot each other. One to five people are designated the “Zombies.” They each are equipped with a gun. All other guns are put into the center of the room (if students brought their own gun, that also goes into the center–we allow students to grab whatever gun they’d like, but you can have the rule that students who brought theirs get theirs). The Zombies shoot the living with their guns. When a person is shot, they go grab a gun. This continues until the last person without a gun wins! Each side has a gun. All of the bullets are sprinkled along the center line of the room, like you would for Dodgeball. Students race to the center to grab bullets for their gun and shoot each other. They must stay on their team’s side. Like dodgeball, the last person standing wins for their team! At a certain point, like when there are five or less on one side, you can call “NO BOUNDARIES” and they can cross to each other’s side. Each team gets their color of bandana for their team.